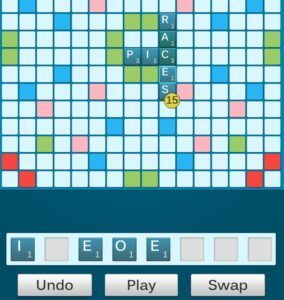 Smartfeud is a game that looks and feels like the traditional Scrabble-like games on your tablet or phone. But, it’s got more to it! Let us show you how it works. After downloading and installing the game you’ll have to log-in or create a user-account. No user account? No problem. Click here to sign up. So you created an account! Great, welcome to the ever increasing number of SmartFeud-players! When you tap on ‘Settings’ in the main menu you get these options. Dictionary. Here you can select in what language you’d like to play. Your native language not there? Don’t worry, we are probably working on that. Play Mode. Here you can select if you want to play in normal mode (standard) or professional mode. In professional mode the game is even harder. As soon as you play a word that is not in the dictionary you lose your turn. Professional mode is only available in the paid version of SmartFeud. Board Layout. Here you select if you want to play with the standard board layout, or if you prefer a random board, where the bonus-squares are all mixed up. Profile. 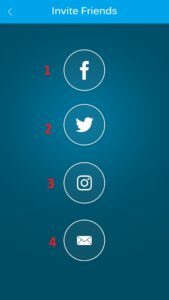 Tap here to edit your profile, change your profile picture, change your password, etcetera. The game settings. Here you can change the game-language. You can switch notifications on or off, activate vibration, set the notification ringtone, decide if you want to confirm eacht word before you play it, en set the waiting times. Default waiting time is 48 hours, so your opponent has two days to play a word. You can set this time to 24 hours, 12 hours, or even just a few minutes for a real quick game. It is also possible to go to the list of blocked users, and unblock them. So, you’ve got the game settings the way you want them to be. Great. Let’s play a game! Here all games are listed where it is your turn to play. Click on a game to open the board. Here are all games listed where your opponent is to play. 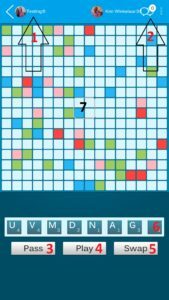 Click on a game to open the board. Here you can see if you’ve got any chat-messages, and how long ago the last word has been played in this game. You can scroll down and see the games for which you invited people but they did not yet accept, and also your finished games. This is the filter button. You can filter your search results, to find a player with a minimum skill rating, or with a maximum waiting time. 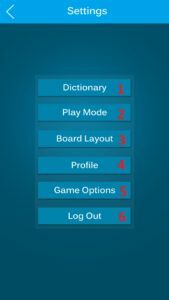 This goes to settings, to set the language of the dictionary, the preferred board layout, the playmode and the maximum waiting time. These settings apply to all new games you start, including with random opponents. Tap here to see your list of SmartFeud-friends. People whom you have played before automatically pop up in this list. 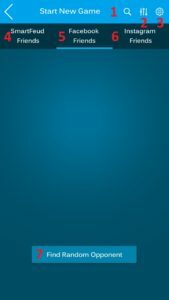 Tap on a a players profile picture to see his statistics, or tap on the challenge-buton to invite him or her for a nice game. Tap here to see your Facebook-friends that have SmartFeud installed as well. Tap on the challenge-button to invite them. 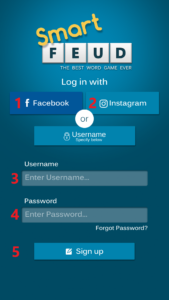 Tap here to see your Instagram-friends that have SmartFeud installed as well. Tap on the challenge-button to invite them. 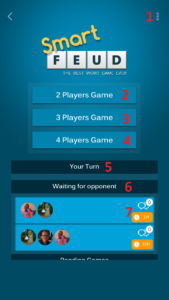 Tap here to play a game with a random opponent. If you start a random game the system matches you with a random player who uses the same dictionary as you, and wanted to play random as well. This can take some time. If you set a filter to select a player with a minimum skill rating, this applies as well. So, you invited a friend, he accepted your challenge, great, let’s play! 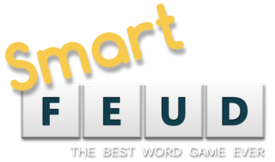 This is the board on which you play a game of SmartFeud. Here you can start a chat with your opponent(s), and click on the three dots to go to an in-game menu to see with what settings you are playing, or resign the game. Use this button to pass your turn. Did you put a good scoring word on the board? Great, push play to play it. Maybe you don’t have the letters you’d like to form a word. 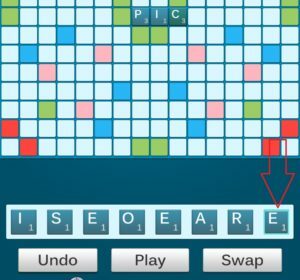 Use the swap button to change some of your letters. It will cost you your turn! The starting player gets a free blank tile to use at the first turn. 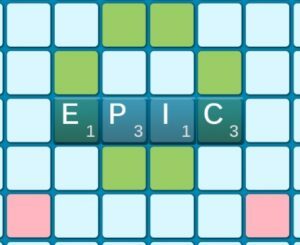 So you can form an 8-letter word and collect the 50 point bonus! Your first word has to be played on the middle of the board. One letter in one of those four squares is enough. Now it’s your turn. Let’s take the ‘E’ from the board. We can use that! You drag the letter to the position on the right bottom. Great. Let’s puzzle! How about races? Enjoy the game! And don’t forget to invite your friends! How to do that? In the main menu, go to ‘invite friends’. Opens Facebook, and let’s you select friends from your friends list. Want to get the highest scores? Don’t forget to check out our tips&tricks-page!